These Halloween scrapbook titles are just what you need for your October scrapbooking pages! Halloween is a great time for taking photos and making scrapbooking layouts! Whether you’re scrapbooking about carving pumpkins or creating pages featuring your favorite costumed princesses, ghosts, witches and wizards – October and Halloween is the perfect season for taking pictures and making memories! 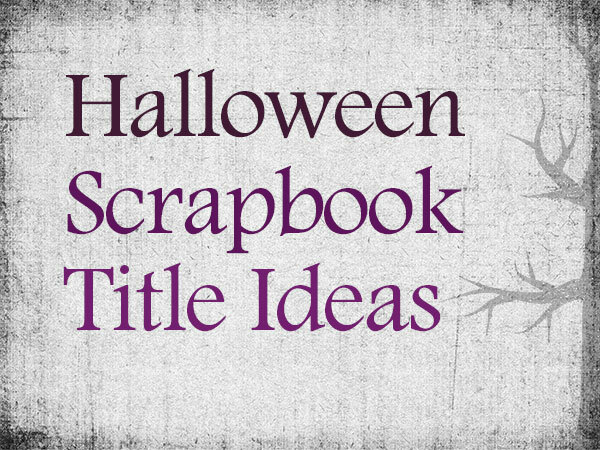 We did some brainstorming and couldn’t wait to share some of our favorite ideas for Halloween scrapbook titles ideas. Hopefully this post will give you some spooky inspiration for your pages! Hopefully these ideas will get your creative juices flowing for scrapbooking all of your favorite Halloween and October themed pages! Have any other Halloween scrapbook title ideas you would like to share? Tell us about them in the comments section below!